To say that Edmonton’s music-lovers miss this venue is an understatement. Those who came through the Haven’s door did so because they shared a love for music, community and learning. Though it’s no longer around, many musicians from those famous jazz-jam nights are still in contact or working with one another. The walk up to 15120 Stony Plain Road was a gritty one. Dimly-lit advertisements for adult parlours, pawn shops and liquor stores offering Air Miles for a cheap bottle of rye would have you beg the question, “am I at the right place?” It made opening the door to The Haven Social Club’s smell of stale beer oddly comforting. Walking down the narrow stairs was a bit disorienting as your eyes adjusted to the dimly lit, swanky digs featuring red upholstered walls and dark-stained wood partitions; but when your foot hit the final stair, you were sure to acclimatize. A smiling bartender, a crisp pint and a lively band all meant one thing: you made it. Ladies and gentlemen, welcome to the Haven Social Club. For a time, The Haven Social Club was one of Edmonton’s under-appreciated and intimate music venues, offering live music in a gamut of genres. From its humble beginnings in 2009 until its doors closed in 2013, the Haven was a place where community gathered to listen to artists in a comfortable venue that felt like your basement. When the Haven opened in 2009, few of the current tenants existed on Stony Plain Road – save the adult-only stores, of course. Today, organizations have popped up, brightening Stony Plain Road like United Way, Bikram Yoga West Edmonton, Revolution Cycle and Shoppers Drug Mart. For owner James Leder, the Haven was meant to be a hub of activity and community gathering place for the kids next door at Grant MacEwan University. 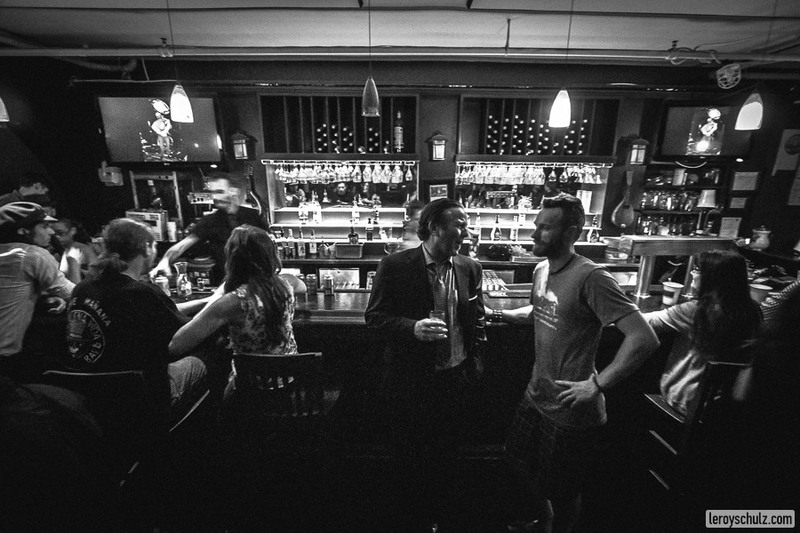 Previously the Black Spot Cafe, it took some stellar convincing to the landlord to get a bar/venue started in the space, but lucky for Edmonton, the Haven Social Club came to life. A few years into the Haven’s tenure, Leder realized the LRT construction was light years away from its touted expansion, so he dismissed the idea of investing any money into revitalizing the Haven’s ‘storefront’ on Stony Plain Road. In the 80’s, Stony Plain Road was a hub of activity, “so there [was] always that thought of what has been, [could] be again,” explains Leder. Sadly, for this hidden-away spot, the Haven’s lifespan wasn’t a long one. In its heyday, the Haven housed many bands from newly-formed local acts to touring bands big and small. As Leder explains it, small venues are the gateway to the music industry and life as a professional musician. The culture is created around people getting their ‘legs’ in small venues so they’re able to play confidently in larger venues. The Haven Social Club was home to Edmonton’s underground music community. It was a space for budding musicians to strut their stuff to a new and welcoming audience. It was a haven for friends to meet up and enjoy a few (or many) reasonably-priced Yellowhead brews; a haven for curious music-lovers to witness carousels of touring, lesser-known musicians finding their way to stardom. And sometimes, it was merely a setting to catch a humdrum act, one doing what they could to stretch their professional wings. Local bands played at the Haven because of its size: not so big that a band had to grapple pricey venue fees and not too small that you felt like you were actually jamming in your mom’s basement. For more seasoned bands, it was a great spot to bring out a crowd of loving music fans who would gladly make the modest trek to Edmonton’s central west side. When the Haven opened, Bill Bourne played in what wasn’t a flagship night for the club. The sound system wasn’t completely dialed in, so the listeners who sat at the back of the room couldn’t hear a thing. But it didn’t matter—Edmonton’s music geeks were looking for an intimate setting to enjoy unique music. When the kinks were worked out, the Haven became a destination for some of Canada’s most famous indie performers. “Dan Mangan first played at my club, opening up for Jen Grant,” remembers Leder. “He stood up on the table singing his robot song. He had the whole crowd singing with him. And that was one of the moments where you stopped and thought ‘that person’s got something that’s above other people.” Mangan played three separate times at the Haven, following with a sold out performance at the Meyer Horowitz Theatre and then the Winspear Centre. It’s crazy to think that someone’s musical career was amplified, even by just a little bit, by an open, appreciative audience in one of Edmonton’s music venues. Mangan wasn’t the only famous musician to walk down the Haven’s creaky stairs either. Royal Wood, Aaden Knight, Peter Katz, Emma Lee and South African band, Civil Twilight, all graced the Haven’s stage at one point. It might be off the beaten path but the Haven was surely on the radar for many famous musicians. When Ron Sexsmith—award winning Canadian musician famous for his melancholic pop folk music— rolled through the Haven, he wanted to do something different. He had already made his mark on the music scene and wanted to play somewhere intimate, which was an immediate two-day sold out affair. These are the kinds of shows that gave the Haven staff goosebumps. Mixed into the touring wonders who came through Edmonton, another ingredient that made this spot a second home for some was the open jazz jams on Wednesday nights. Bringing Edmonton’s amateur and professional music community together, the space gave new musicians the opportunity to expand their musical vocabulary and play alongside their peers. Midweek became a beloved night for the regulars who frequented the sultry space. “There were some great moments that I wasn’t part of [at the Haven], that I’m jealous of,” says Leder, who credits Jonny MacCormack, Ian Morris and Stefan Kijek—students of the Grant MacEwan jazz music program—for starting the open jazz jams at the club. “You know, Wednesday nights were what made the Haven,” reminisces Leder. From left to right: Chad Rivard, Ian Morris, Rob Vollick. Photo courtesy of Ian Morris. In the very early days, local musician Kent Sangster tried to kickstart a jazz night at the Haven, but never found success because the crowd he targeted was wary of club’s location, figures Leder. “The only reason we eventually established a solid Wednesday night open stage was because MacCormack, Kijek and Morris did such a good job of building it. Otherwise, it wouldn’t have happened,” he explains. These weekly jazz jams started off extremely small, hosting only a few musicians before the other Grant MacEwan students in the area picked up on the jam’s offerings, including the dance styles of Haven’s sweetheart Sheila who became a regular during these open jams so she could dance to the music. Before long, it grew into a must-attend—and right of passage—for the dedicated students/musicians in the room. Ian Morris explains that the Haven had a powerful effect over building his ‘musical family’ through the Haven’s jazz jams. “[L]ittle did we know we would start a completely new musical community within the city’s scene. It had a terrific impact on us all, as we started to develop some serious friendships, some of which have continued to last and are still strong across the country. We stuck together, supported each other and lost track of time in Haven’s underbelly [and estranged child] of the Edmonton art’s scene. Age, race and musical barriers were non-existent. It was all about the hang,” reminisces Ian. A cake celebrating the anniversary of the Haven’s weekly jazz jams. Photo courtesy of Ian Morris. The popular weekly event gave many the experience and confidence to improvise and innovate with their peers in the community. MacCormack would often be heard encouraging everyone to “buy lots and tip well,” one of many signature lines you would hear in between sets. Wednesday’s jams were truly a unique combination of comfort, excitement and community-building. To say that Edmonton’s music-lovers miss this venue is an understatement. Those who came through the Haven’s door did so because they shared a love for music, community and learning. Though it’s no longer around, many musicians from those famous jazz-jam nights are still in contact or working with one another. “To witness the role the Club played in the advancement of the Edmonton indie art scene was gratifying,” says Leder. Edmonton has an incredible music community, and this city will always starve for the door-is-always-open style hangouts that offer the same raw character and talent that the Haven could. Welcoming venues where the pints pour cold, the laughs are loud and the music is invigorating will always have a home in this city. Klingbeil, A. Popular live music joint closing at the end of July. Metro Edmonton, 2013. LINK. Sperounes, S. Black Spot Cafe Aids City Starved for Gig-Worthy Space. Edmonton Journal, 2007. LINK. Communications professional. Music lover. Yoga nut. Dancer. Arts advocate. Writer. Forever curious about community and culture, Jamie brings a lot of energy and dedication to her work. As she carves out a meaningful spot in the marketing and communications world, she’s writing about Edmonton, sharing the stories of her family and her roots in Edmonton. Find her on twitter @JamieAusm.